Jack’s can supply you with a replacement Briggs and Stratton Fuel Pump or replacement diaphragm. 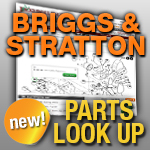 To find your Briggs & Stratton Fuel Pump just look below! For more information on ethanol fuel check out Jack’s DIY section, where you will find tons of videos and information.